The concept of Corporate Social Responsibility (CSR) developed alongside the emergence of corporations more than a century ago and is now practiced by most companies and institutions around world. While corporations may vary in their level of commitment to CSR, their practice is largely focused on corporate philanthropy such as donating to charities, supporting causes or sponsoring individuals, groups and programmes. However, some companies, intent on making their CSR impact more effective, are rethinking this approach. Among these companies is Guaranty Trust Bank (GTBank) plc, a leading African financial institution headquartered in Nigeria and spread across sub-Saharan Africa and the United Kingdom. GTBank has always been heavy on CSR. The bank maintains a clearly defined Corporate Social Responsibility (CSR) strategy with targeted focus on Education, Community Development, the Environment and Arts. Among its landmark CSR programmes are the GTBank Adopt-a-School programme through which the Bank has taken over the provision of facilities to some public schools across Nigeria’s six geopolitical zones. The Bank also sponsors three annual secondary school football tournaments—The Lagos State Principals Cup, the Ogun State Principals Cup and the Masters Cup—all of which have become major grass-roots football competitions in the country. The bank’s backed Orange Ribbon Initiative is the foremost Autism-focused initiative in the country providing support and raising awareness for people living with Autism Spectrum Disorders. Not resting on its CSR feats, GTBank is innovating how it gives back to its communities by going beyond traditional corporate philanthropies to intervene in key economic sectors to strengthen small businesses through non-profit consumer focused fairs and capacity building initiatives that serve to boost their expertise, exposure and business growth. The first big example of this new approach was the Food and Drink Fair which the bank organized in May. Although the event had all the flavours of Food festivals, with world-class chefs such as Marcus Samuelson and Raphael Duntoye serenading cooking masterclasses, its raison d’étre was to boost the enterprise of indigenous SMEs in the food sector. In that front it succeeded quite remarkably with over 25,000 guests attending the fair and the over 100 SMEs seeing record sales of their products. GTBank is now looking to repeat what it achieved with the Food and Drink Fair in the Fashion sector. “We are thrilled to be the first in the Nigerian financial sector to pioneer an initiative that will assist in unlocking growth opportunities for businesses in the fashion industry,” said the Bank’s MD, Segun Agbaje, in a Press Release announcing the GTBank Fashion Weekend set to take place in November. “We are committed to growing SMEs in a sustainable manner that is not driven by profits but focused on empowering our customers and growing our economy collectively.” The Weekend, it is understood, will have all the glitz and glamour of fashion events but at its core will be the theme of Promoting Enterprise, which will be achieved through the Fashion MasterClasses for entrepreneurs and designers as well as retail exhibitions to boost the sales of local SMEs. 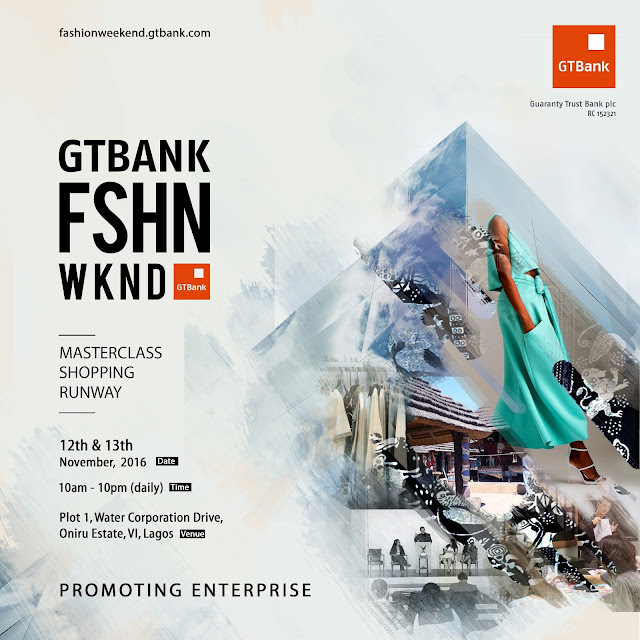 While in the process of organizing the Fashion Weekend, GTBank also announced the launch of its virtual arts gallery which the bank said will serve as a free platform for local artists to exhibit their artworks and achieve greater market exposure. “At GTBank we see art as an avenue for unlocking people’s creative potential and by creating ART635 we aim to expand the opportunities for art education as well as broaden the reach and viewership of the works of indigenous artists,” said Mr Segun Agbaje in a statement announcing the gallery’s launch. “Although African art goes back several centuries, the art industry in the continent is still young and largely untapped and we hope that with ART635 we can drive its evolution into a lucrative and vibrant economic sector,” he added. Given the depressed economic situation in Nigeria, and indeed across sub-Saharan Africa, GTBank’s new approach to CSR is an apt response from a company keen on boosting the general economic fortunes of its community. Small businesses, on which the economic growth and development of most African states depend, need not just financial empowerment but also capacity building and access to market, aspects that GTBank’s CSR-tweak does address. The company’s new approach to CSR also shows that far from just innovating for business growth, companies and organizations must always evolve how they give back to their communities to ensure that their CSR programmes continually make its desired impact.